NuLu's Valentine Open House | Louisville Real Estate with the Joe Hayden Real Estate Team - Your Real Estate Experts! 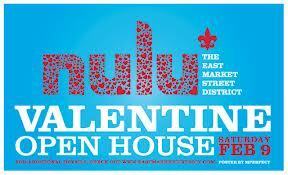 If you are looking for something to do on Saturday, February 9th, consider heading down to NuLu for their Valentine Open House! Most businesses in the district will be offering discounts, promos, treats, and more! Additionally, make sure to fill out an entry form at any participating business for your chance to win A Valentines Gift Basket full of NuLu products and gifts for your Special Someone! Only one name will be drawn, so don't miss this special event! Some of the "deals" of the day include 10% off at Toast on Market for bringing in a receipt from a NuLu retailer, 20% off furniture at Red Tree, and a free chocolate from Ghyslain with a receipt from any NuLu retailer plus much, much more! To find more fun events, please visit the website of the Joe Hayden Real Estate Team.